With everything that’s going on in the very busy life of a active construction site, worrying about the keeping and curating of daily construction logs may seem excessive. After all, one of the reasons doing daily reporting is a task no one wants to get stuck with is that it's time consuming to do. Not to mention tedious. And if we're mentioning tedious, we might as well bring up repetitive. Sure, sometimes big, dramatic changes (both good and bad) happen at a construction site, but let's be honest. There are days as well when it just seems to be more of that same old, same old. Is it really necessary to keep track of it on a daily basis? All federal, most state, and an increasing number of local governments require contractors to file and eventually produce daily reports on topics ranging from staff safety meetings to employees present. And a correctly completed and filed daily report can be a firm's best friend in legal matters, whether they're the plaintiff or the defendant. In chronicling construction daily activity, scribes are recording both best and bad site practices, information that can be both used (or avoided) to achieve good results on similar future projects. While everyone wants that project to rocket along to a satisfying conclusion, the reality of construction projects is that there are often delays, and frequent work starts and stoppages. And it's not just payroll procedures and subcontractor safety protocols that managers will have to recollect. During delays and work stoppages, firm, partner, and stakeholder personnel may come, go, and be promoted internally. 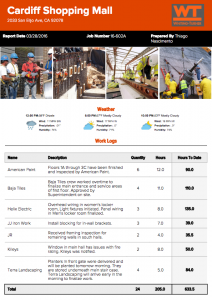 Well-kept and curated daily notes not only help construction staff to remember important work details and contact information, it helps partners and others both get into the loop or never leave it at all. So rather than being looked at as a tedious daily drag, that superintendent daily report should be appreciated for what it is. It's an important document that protects both firms and customers, and helps to produce projects that are fast, safe, and profitable. Considering this information,it just makes sense to be doing daily reports the Raken way.